The partying on Broad Street will continue on Thursday. The City of Philadelphia announced details for the Eagles’ Super Bowl parade on Tuesday. It will begin at 11 a.m. on Broad Street and Pattison Avenue and conclude with a ceremony at the Philadelphia Museum of Art. Begins at Broad Street and Pattison Avenue in South Philadelphia at 11 a.m.
A visual of the parade route was provided by 6 ABC. Here are the rest of the parade’s details, according to the City of Philadelphia website. Parade: Kicks off at 11 a.m. at Broad Street and Pattison Avenue, heading north toward the Art Museum. The parade will last approximately two hours. Formal Celebration: Begins at 1 p.m. in front of the Art Museum. The program will last approximately two hours. NBC10 is the official broadcast partner for the Philadelphia Eagles Super Bowl LII Championship Celebration. The celebration will air live on NBC10 and NBC Sports Philadelphia. It will also stream on NBC10.com and NBCSportsPhiladelphia.com. All Philadelphia public and parochial schools will be closed on Thursday, February 8. All Courts and Philadelphia Courts offices will be closed. If you are scheduled for Jury Duty on Thursday, February 8, 2018 do not report for service. You will be rescheduled at a later date. All critical Court services are expected to remain operational. Philadelphia City Council has cancelled its stated public meeting for Thursday. Trash and recycling pickups are suspended on Thursday, February 8. Thursday’s pickups will be made on Friday, and Friday’s pickups will be made on Saturday. Motorists should avoid the areas along and around the parade route, including Broad Street, Center City, and the Benjamin Franklin Parkway. Drivers should use alternate routes and allow for extra time when traveling in the area. Some bicycle lanes around the Parkway are also affected. There will be significant travel delays on Thursday. Additional road closures and lane restrictions may be necessary during the event to maintain public safety. Streets will begin to reopen as early as conditions allow on Thursday, February 8. Most streets should be reopened before the morning rush hour on Friday, February 9. Commuters should allow for extra time on Friday morning, however, as there may be residual delays as operations return to normal. All visitors are encouraged to take public transit when coming into Philadelphia. SEPTA is operating a special Eagles Parade schedule with details available online at SEPTA.org. There will be parking restrictions along and around the parade route. These restrictions go into effect at 6 p.m. on Wednesday, February 7, and extend into the late evening on Thursday, February 8. Cars parked in temporary no parking zones will be relocated. If your vehicle has been relocated, you may call 215-686-7669 for the location. A full list of the affected streets is available online. If at all possible, visitors should not drive into Center City. If, however, driving is necessary, the City encourages drivers to park in off-street lots and garages along the Parkway, Broad Street, or near the stadium complex. The Philadelphia Parking Authority also has a list of garages online. If visitors must drive, they should contact individual parking facilities for rates and availability ahead of time. There will be no enforcement of meter and time limit regulations on the day of the parade. Safety violations such as parking too close to the corner, fire hydrants, blocking crosswalks, and double parking will be enforced. There will be significant travel delays on roadways and street closures immediately before, during, and after the Eagles Parade. 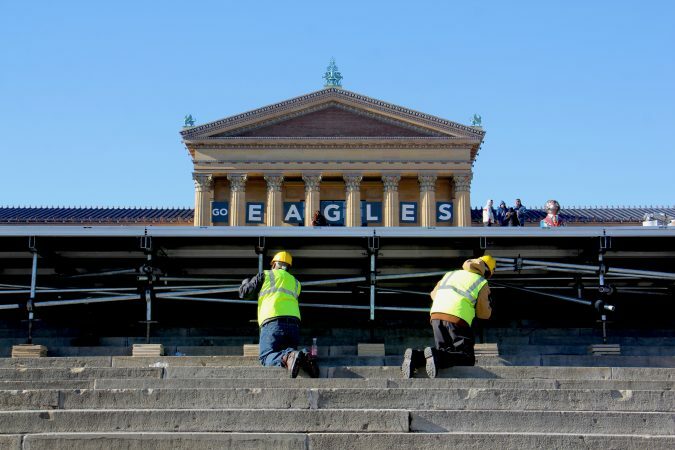 For the most updated information on transit, public safety, and other news relating to the Eagles Parade, please sign up for ReadyPhiladelphia alerts from the Office of Emergency Management by texting “ReadyEagles” to 888-777. The City asks the public to do their part, use common sense, and stay aware of their surroundings. Attendees should immediately report suspicious activity by notifying a police officer or dialing 911. Should not leave bags unattended and immediately contact police if they notice an unattended bag. Make a plan regarding travel and supervision of children. Make a plan in case they become separated from their parties, including identifying meetup points in case of separation. Ensure children have contact information for their parents or guardians on their person. Should sign up for parade related text alerts by texting “ReadyEagles” to 888-777.